Thought you might like to receive these photos of our beautiful shed. We are so happy with it. With the landscaping done, it looks like it belongs now. We especially love the little window in the front, which looks good inside and out. Hope you can use the photos for your records and our recomendation. Thank you again for all your help and advice. We are very happy with both the quality of the building itself & the workmanship. I will have no hesitation in using your company again or recommending you. I just want to say thanks for the excellent job your guys did on our garage. From the time it was ordered, to delivery and then putting it up has been flawless. In this day of hustle and bustle its great to know there are people out there who still see good customer service as a necessity. Thanks again for a great job! Just a short note to say how impressed I was with you and your company. From the outset you provided good advice and excellent service. The carport arrived when you said it would, everything was there, the instructions where clear ,it went up much easier than I anticipated and we are very happy with the finished product. Thanks Again and I will definitely recommend you to my friends. I justed phoned to say thank you what an excellent job your company has done. 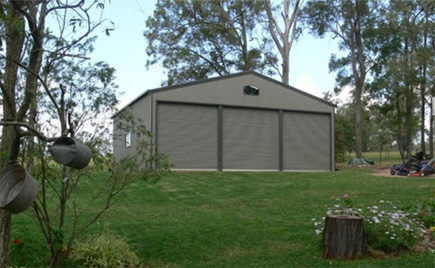 The product is great, I'm very happy with my shed. The contractors you referred were great. I will defenently refer your company.